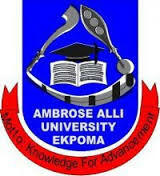 The Ambrose Alli University, Ekpoma [AAU] Part-Time Degree Admission List for 2017/2018 Academic Session Uploaded Online. This is to inform all candidates who applied to the various part-time degree programmes of the Ambrose Alli University, AAU that the admission list for the 2017/2018 academic session has been released. Applicants are advised to log on to the university e-portal to confirm and check admission status. Input your registered details and log in to view admission status. Congratulations to all admitted students into the Part-Time Degree Programmes of the Ambrose Alli University for 2017/2018 Academic Session.